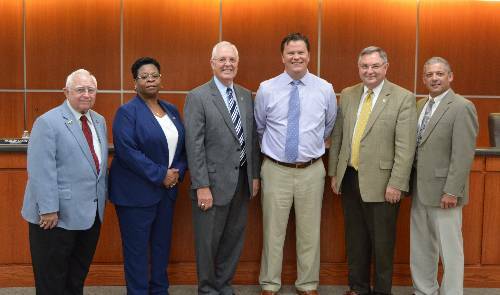 The Harnett County Board of Commissioners has named Joseph Jeffries Harnett County Manager. The board voted unanimously to make Jeffries county manager during Monday morning’s commissioners meeting. Jeffries assumed the role of interim county manager in December 2014, following the departure of then-County Manager Tommy Burns. Board of Commissioners Chairman Jim Burgin said the board has been impressed by what Jeffries has accomplished while serving as interim manager. “He is extremely responsive in anything we asked,” echoed Vice Chairman Gordon Springle. Chairman Burgin said he has heard nothing but positive comments about Jeffries from county employees. “Every staff member I’ve talked to says they appreciate the job Joseph is doing and that he’s willing to listen whenever they have anything to say,” he said. In naming Jeffries county manager, commissioners made an exception to the job description, which states that the county manager must live in Harnett County. Jeffries lives just across the county line in Wake County, but he grew up in Angier and graduated from Harnett Central High School. Jeffries attended East Carolina University, where he graduated in 1996 with a bachelor’s degree in Urban and Regional Planning. He was hired as Chief Planner with the Harnett County Planning Department in 2002. He was made Manager of Planning Services in 2003 and was promoted to Planning Director in 2006. He was made director of Planning & Development Services in 2007. He earned a certificate in County Administration from the UNC Institute of Government in 2005. He previously served as interim county manager in 2012 and was made deputy county manager in April 2013. Jeffries said he is excited about the opportunity to serve as county manager. Having come into the Harnett County through the Planning Department before taking on a role in administration, Jeffries said he understands the needs of county employees. He said Harnett County has much to be proud of and is well-positioned for the future growth and development. Jeffries and his wife, Maria, have been married 17 years and have three children.